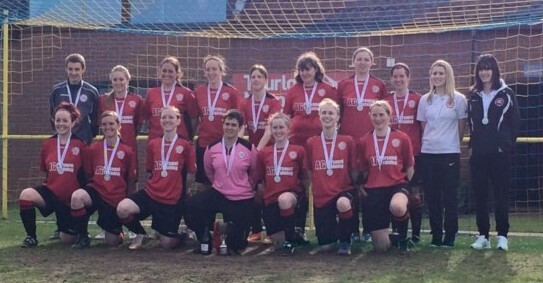 Wymondham Town Ladies beat Brandon Ladies 2-0 in the final of the League Cup on Sunday in front of a good-sized crowd at Norwich United’s, Plantation Park. From the first kick of the game Town looked very comfortable and in control. They were denied a penalty after what looked like a foul in the box but kept the pressure on throughout the first half and after a poor challenge by the corner flag they seized their opportunity. A great free-kick was met by an even better header from Laura Hammerton to put Town 1-0 up. Town almost went 2-0 up shortly afterwards when a 30 yard drive rattled the cross bar. Brandon came out in the second half with a new fighting spirit and put Town under a lot of pressure. But they never really created anything until the 65th minute when their striker unleashed a powerful shot from the edge of the area and Gemma Hamilton, Town’s 5ft 2 in keeper, saved athletically down to her left hand side. Town then rediscovered their first half form and pushed forward after tactical changes by manager Alex Guy. Wymondham saw another pile -driver rebound of the crossbar before Hammerton was on hand to score her second header of the game from a perfectly placed corner. Town never looked like conceding and comfortably saw the game out and were deserving winners. The player of the match award, decided by the league committee, went to Amber Cantwell for her strong performance on the wings.